A 990 metre high mountain in Antarctica was named Mt. Sinha after Indian-American research scientist Akhouri Sinha who made population studies of seals, whales and birds there in the seventies. Inset: Akhouri Sinha. Washington, July 6 (IANS) Back in November, Akhouri Sinha, an Indian-American research scientist, was looking for some information to write a few words on the death of his team leader on an expedition to Antarctica in the seventies. To his surprise, he found a Wikipedia entry dated May 17, 2012, saying a 990-metre high mountain at the southeast extremity of Erickson Bluffs in the south part of McDonald Heights had been named Mt. Sinha after him. 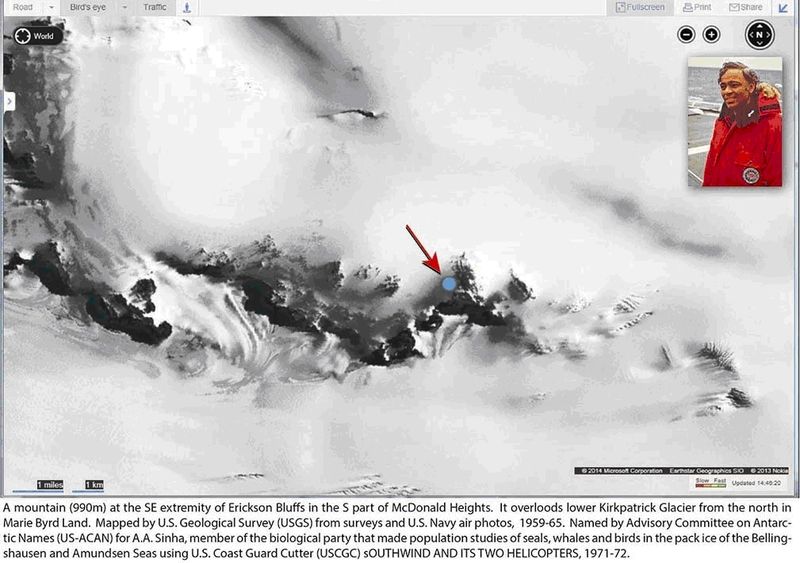 Overlooking lower Kirkpatrick Glacier from the north in Marie Byrd Land, it was “mapped by United States Geological Survey (USGS) from surveys and US Navy air photos, 1959-65. “Named by Advisory Committee on Antarctic Names (US-ACAN) for A.A. Sinha, member of the biological party that made population studies of seals, whales and birds in the pack ice of the Bellingshausen and Amundsen Seas using USCGC Southwind and its two helicopters, 1971-72,” the entry read. “After I moved to VA, I was nudged to work something relevant to veterans’ diseases,” Sinha told IANS in an email interview. Currently, he is working on human prostate cancer. Sinha, who has a BSc degree from Allahabad University and an MSc degree in Zoology from Patna University, taught in the Department of Zoology at the Ranchi College before coming to the US in 1961 to do his PhD at the University of Missouri at Columbia. He has published over 100 papers while teaching graduate level courses for almost 25 years. “Akhourys have lived in the village of Churamanpur which was established in 1739 by my forefather, Akhoury Churaman Singha (now Sinha),” he said.